Take a hike, you douchebag. And you can take Gary Sinese with you. You are both Republican tools. I was watching CSI: NY tonight. The premise was this: dere’s dis guy (oh, wait, this is NY not NJ, sorry) and he’s using technology to kill people. First, he takes over a car’s GPS and directs the victim to a bad area of NYC, then takes over the On-Star type service to first enjoy taunting his victim, then listening as he dies. Another guy dies when the killer takes over the restaurant ordering system to give this victim a double helping of peanuts instead of the peanut-free dinner that was originally entered by the server. As the victim’s throat closes up the killer is on the phone (who knew killer’s answered 911 calls? ), asking for the gory details as to whether the victim has turned blue yet. MUWAHHHH! Sounds interesting, right? I thought so. Turns out, this guy was killing specific people; a doctor, the owner of a hospital, and staff members who had the unfortunate job of telling him that he no longer had insurance and they would not treat his advanced stage cancer any more. He chose Mac (Sinese’s character) to “tell his story” because Mac’s father had died of a pretty invasive cancer, too, and he just knew that Mac could relate to him after watching his father die of a similar cancer. I would have forgotten the plot line as just another interesting CSI plot (it’s hard to feel sympathy for a killer, but it’s also difficult to not feel sympathy for a man who maybe had a chance if he could have gotten the chemotherapy and other treatment he needed, a thought provoking dichotomy, to be sure) – until the very end when Mac made a little speech to the killer, who was now in the hospital, getting treatment for his cancer, at the city’s expense, saying that the killer was nothing like his father! His father would have been proud to say that he lived long enough and it was his time to go – and go quietly into the night, happily (singing patriotic songs as the life flowed out of his body, I am sure). Of course, his dad had insurance, which took care of him until there was nothing left to do, but his time had come and it was time to go and go proudly he would. Glad to die, by golly! One guy has insurance and runs the course of his therapy and the other who is no longer insured (the reason was not given) is cut-off mid-therapy. One might think this could be called a false equivalency. Not in the eyes of these Republican tools – rich, Republican tools who could pay cold hard cash straight from their personal checking accounts for a heart transplant – several times a year. I am washing my hands of the far too many Bruckheimer franchises. One viewer down. And I didn’t even have to die to do it. TERRORIST ATTACK WIPES OUT ENTIRE STATE OF VERMONT! Vermont, a state with a population of 621,270 was wiped out in a recent terrorist attack. Thanks to the health insurance industry and the Republican Party, they have killed over 640,000 American citizens since 1993. If that were to happen in one day, surely it would be labled a terrorist attack of the worst order. But because they make a profit, people threaten to leave the Union, to start a civil war, to protect … the terrorists! How Dare the President bid for the Olympics! There has been much ado, of late, concerning President Obama trying to procure Chicago as the 2016 Olympic site for the United States of America. Chicago, they say, is just part of the dirty Obama/Chicago Machine. THE PRESIDENT: I want to thank the members of the 2016 Chicago bid to get the Olympics. Listen, Mr. Mayor, you and your committee have put together a great plan. It’s a plan that will make America proud. They say that the Olympics will come to Chicago if we’re fortunate enough to be selected, but really it’s coming to America, and I can’t think of a better city to represent the United States than Chicago. This is a well thought out venue. There will be — the athletes will be taken care of. People who will be coming from around the world will find this good city has got fantastic accommodations, great restaurants. It will be safe. And so I — this country supports your bid, strongly. And our hope is that the judges will take a good look at Chicago and select Chicago for the 2016 Olympics. Oh, wait, that wasn’t President Obama who said that, it was President Bush, on January 7, 2008. Must have been something to do with the tens of thousands of jobs that would be created over the next eight years and the millions of dollars that would be injected into this craptastic economy by dozens of countries worldwide. We definitely don’t need that! This is our open thread. Please feel free to offer your own comments. 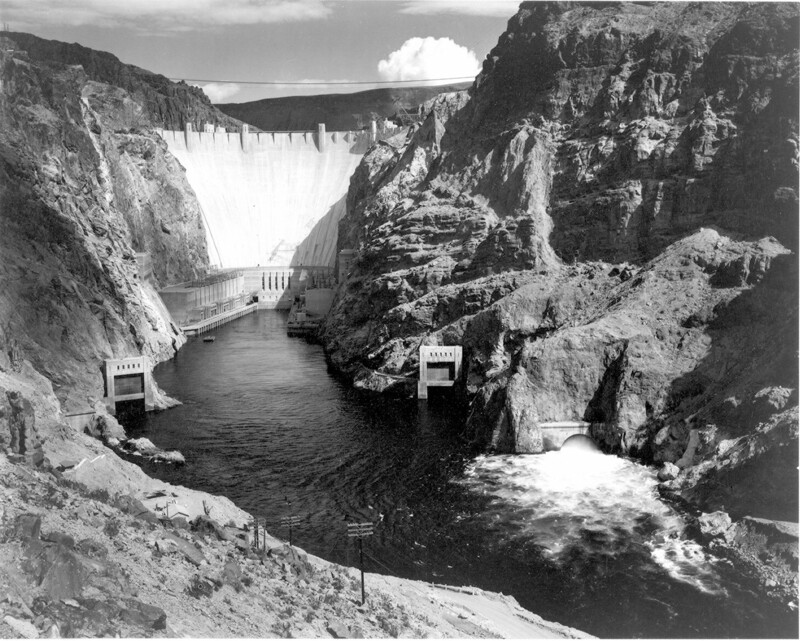 On this date in 1935 Hoover Dam (called Boulder Dam at the time ) spanning the Colorado River between Arizona and Nevada was dedicated. It left behind Lake Meade and a recovering western economy. Water passed through its turbines at near terminal velocity which was only dampened throttled in order to eliminate cavitation which would have reduced efficiency and caused erosion of the turbine blades. The dam was a key factor in America’s WWII effort only foreshadowed by the TVA. The Manhattan Project was a mere afterthought in the war effort. I had a bit of a setback today as I cut my hand while shucking fresh oysters. The modern way to shuck the things is to use a towel. When I was 8 years old, I worked in a German Restaurant in Baltimore where oysters on the half shell were on the menu. I was issued a lapboard with a vee shaped holding dam and a one inch hole in the center for the actual shucking. A bucket caught the results. Prior to sitting down for work, each of the shuckers was given a bushel of oysters to separate and clean. If business was brisk, additional bushels would be cleaned and separated as the evening wore on.